This article presents a brief history of the village of Sambir, also known as Sambor. Full text of the article is prepared in Ukrainian. If you are interested in reading it, please use a web translator. In case you are not satisfied with website translator, we would be very happy to assist you. The town of Sambir was founded in 1199. The first mention of Jews in Sambir dates back to 1447. The royal decrees of 6 December 1542 and 8 January 1551 by kings Sigismund I the Old and Sigismund II Augustus of Poland, respectively, restricted Jews from trading in the town. The decree of 1542 also restricted Jews from living within the city walls. As a result, the Jews settled outside the city in the area called Blich, or Bleich in Yiddish (the name comes from the craft of bleaching fabrics). In 1629 there were alsmost 2000 Jews living in Sambir. 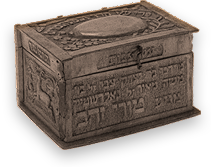 In 1732 Jews were granted permission to build a synagogue and create a cemetery in the Blich quarter. Two kirkuts can be found on the 1856 cadastre map of Sambir. The 1879 and 1933 cadastre maps confirm their location. The cemetery near synagogue is a resting place for many famous residents of the city and the qahal. A prominent rabbi - Isac Harev Haikselberg - is burried here. During the WWI-period, between 1915 and 1916, 25 Jews serving in the Austrian and Russian armies were buried in 12 graves, 21 being Austrian servicemen and 4 Russian. It is noteworthy how developed the Jewish community of Sambir was in social and political ways of life in the 20th century. By 1910, the town had a Jewish library, school and a threater. In 1920s, around 80% of the town's population were Jews, 18% Ukrainians, and 2% Poles. The Jewish community of Sambir was extinguished by the Nazi occupation during the WWII. The Germans broke into the city on 8 September 1939, plundering Jewish property and assaulting Jewish workers. On 20 September 1939, Sambir was taken over by the Red Army. The initial feeling of relief soon evaporated as the Soviets restricted trade and nationalized private business. There were very few privately owned shops left by 1941. Many wealthy and middle class Jews were deported to Siberia. The case of Rela Zeligner, a wife and mother of young daugther, generated a lot of controversy, as she committed suicide for fear of deportation. On the other hand, a lot of wealthy Jews were given government jobs and assigned resposibilities of running the town. The Soviets trusted Jews more so than Ukrainians and Poles. This sometimes led to nationalist tensions. A few days before another Germans reoccupied the town, Russians arrested and then killed a large number of Ukrainian nationalists. The second period of German occupation of Sambir started in June 1941. Jews were ordered to wear the Star of David, their homes were searched, valuables taken away. Throughout 1942 and 1943 thousands of Jews were gathered at the Sambir ghetto and trasported to the gas chambers of the Belzec extermination camp. Many mass killings of Jews were carried out by the Nazis on sacred Jewish holidays, such as Pesah (14 April 1942), Yom Kippur (October 1942) , or Shavuot (9 June 1943), to underscore the inhumane attitude. The evidence of the abovementioned historical events can be found in the State Archive of the Russian Federation in Moscow (Collection R--7021, Description 58, Case 22, Page 17), the State Archive of Ukraine in Lviv ( Collection R-2022, Descriptin 1, Case 113, Description 17) and Sambir, the Central State Archive of the Civic Organizations of Ukraine (Collection 57, Description 4, Case 235, Page 7) and others. Relevant aerial photographs confirming the location of the Sambir cemetery and mass graves were obtained, and later decoded, from the National Archives of the United States. A set of records containing technical reference, archival and geodetic documentation was produced for this site. It is available upon request. If you feel concerned about the state of this cultural heritage site as much as we do and would like to contribute to our continuous efforts to ensure its upkeep and protection, please write to us to support our work.